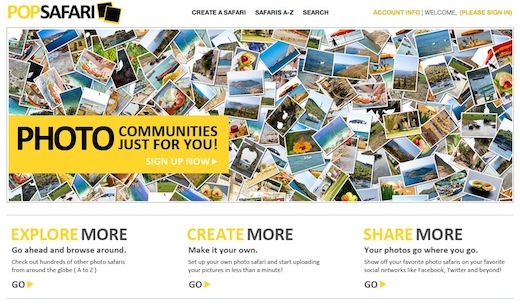 PopSafari is an interesting new photo community site with a twist. Signing up for a free account, or logging in with your Facebook account, allows you to create collections of photos based on any theme of your choice. The site, like Pinterest, allows you to create themed collections made of photographs, but the focus is placed entirely on the collections rather than on your profile. Other users can access your collections or Safaris, and can even contribute images of their own to the collection. Unlike Pinterest, however, you don’t get a personal profile page, which is a much-needed feature for any community site. As the collections grow, they become a virtual safari of any given topic, with current collections already on the site including tattoos and corvettes. Once you’ve created a safari, however, there is no way to delete the collection or individual photos. What you can do is share individual images on social networking sites like Facebook and Twitter, regardless of whether or not you’ve created them. Each Safari can be viewed either by recently added images, or the most popular images, and you can also leave comments on individual photos, provided you’re logged in to your Facebook account. Another pretty cool feature available on the site is the ability to embed any collection in a blog post or page. PopSafari is still relatively quiet, with a small community, but the site has a great deal of potential. It can be used as a collective alternative to Pinterest, allowing users to contribute images to one topic together. But that’s not the only way the site can be used. It has potential to be used as a great way to collect tourist photos from various cities, becoming a virtual tour of any city or country anywhere in the world. It can also be used as a way to create a visual inspiration board for writers or photographers, or can even be used by brands to encourage customers to contribute images of their products. There’s really no limit to how you can put the service to work for you. But in order for PopSafari to really be used to its full potential it does need to add a few essential features. The ability to moderate collections would be an essential feature for brands to take the service seriously, while profile pages and the ability to delete images and collections would also come in handy.